I know I’m not alone to have this opinion – one of the best parts about skateboarding is… simply cruising. Words can’t explain how good it feels to stand on your board and roll for ages. 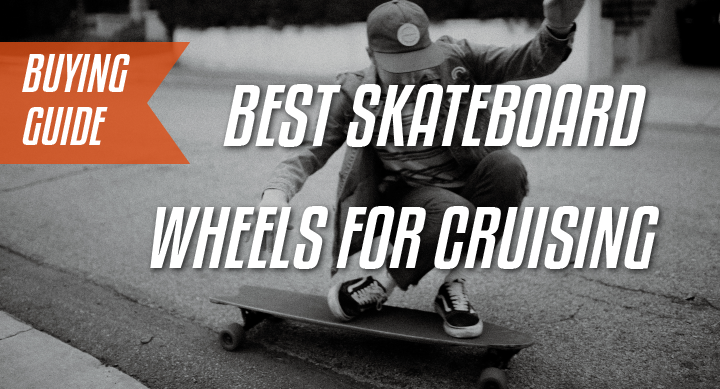 In today’s super short guide, I will go over what makes the best skateboard wheels for cruising, how different characteristics affect riding performance, and which wheel you should get for your given discipline. *The wrong wheel can be too heavy or too tall for your setup, giving you wheelbite and feeling sluggish and hard to push. Wheel diameter is basically how tall the wheel is. The taller the wheel the more momentum it will have when rolling and the easier it will go over cracks, pebbles, and sticks. However, it will be harder to get it rolling. For example, an 80mm will produce a super smooth ride and are the wheels for rough roads, but will be very prone to wheelbite and hard to start pushing. Wheels with square lips will give you the most amount of grip and wheels with round lips the least. This will affect how they grip the road. If you wanna do quick carves, square lipped wheels are the best for that. A wide contact patch (width) will allow you to take sharp turns as the wheel will have more urethane to grip the road. However, this will make the wheel heavier, harder to push and ironically more sluggish in the turn. The durometer of the wheel (hardness) dictates how much road vibration it will absorb and how fast it will roll. A soft 76a wheel will absorb loads of vibration but it will be slow and hard to push. A hard 83a wheel will roll fast but absorb less road vibration. A wheel around 78a or 80 will be the best of both worlds. Soft skateboard wheels will feel the best after riding harder wheels for some time. Typically, the cruiser wheel you get will be dictated by what you want to do with (how you want it to feel) and what your setup will allow. For example, if you have traditional kingpin (tkp) trucks, they will lean more and be lower to the ground so you will be prone to get wheelbite if you get 70mm+ wheels. So the trucks you have will affect which wheels you choose. Reverse kingpin trucks can run bigger wheels (70mm+) because they typically turn more than they lean and sit higher off the ground. If you have tkp trucks, wheels 60mm-66mm+ are recommended as they get wheelbite easier. There are other things you can do to allow you to run tall wheels comfortably. You can get riser pads which increase the height of the trucks, however, reduce the stability of your setup and make your trucks feel even more turny. If you do this to your cruiser setup, it will make it feel surfy and nice. You could also use harder bushings so that its harder to make your truck turn. This allows you to ride comfortably without fear of wheelbite but you will not allow you to turn as quickly as before. 60mm skateboard wheels would be nice if you already have a street skateboard and simply want some softer wheels that can handle the terrain outside a skatepark. If you got a longboard for dancing/freeride etc. You probably have rkp trucks and you can handle 70mm tall wheels. If undecided, your first cruiser wheels should be something that is 66mm-70mm tall, 78a, around 50mm wide (contact patch) and has square lips. This would work very well. It will be tall enough to roll over most things. Personally, I like 70mm, 80a wheels on rkp trucks. They roll and grip great and I can move in and out of crowds really easily.